Watch this video or follow the steps below. Step 1: You can attach emails to record types other than the 3 record types (contacts, customers and vendors) that CloudExtend auto searches for you. 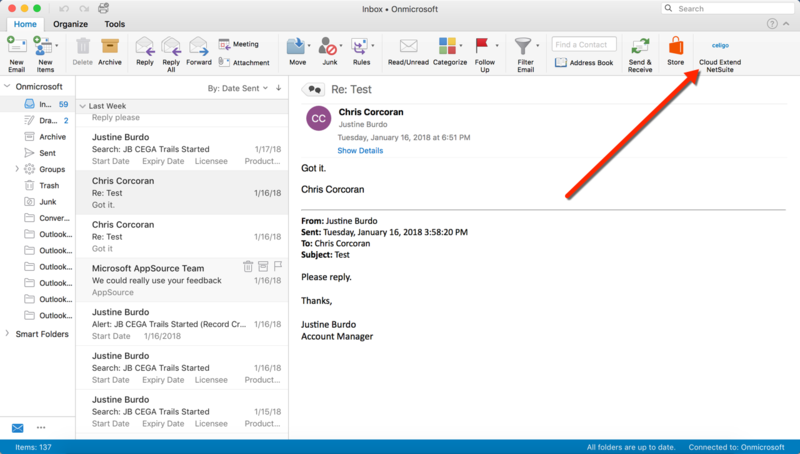 Choose an email you want to attach to NetSuite and click on the CloudExtend NetSuite button at the top of Outlook. Step 2: Click on 'SEARCH NETSUITE' from the home screen (or use the magnifying glass if you already clicked 'ATTACH EMAIL TO NETSUITE'). Step 3: Choose one of the supported record types and then enter in the search critera (company, name, invoice number etc.) and hit enter. Step 5: Once saved, you can view the message by clicking on the envelope or click the NetSuite button to be directed to the NetSuite record.